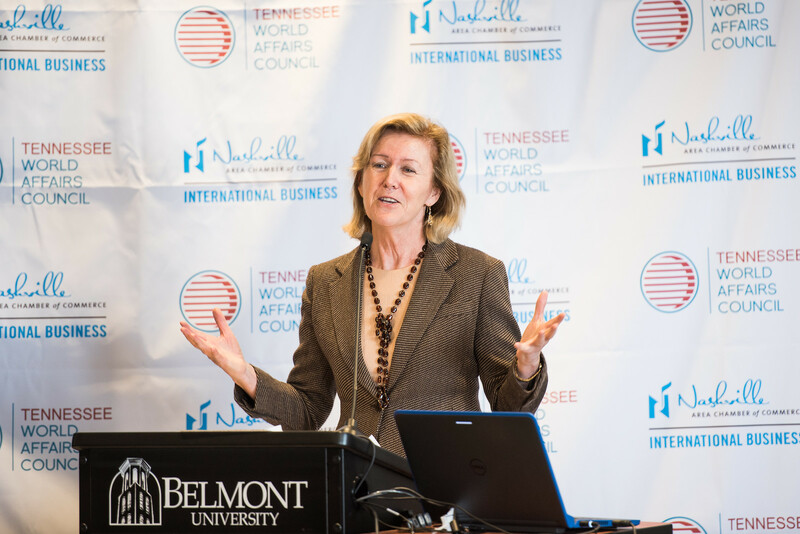 In an event hosted by the Nashville Chamber of Commerce’s International Business Council (IBC) in partnership with the Tennessee World Affairs Council (TNWAC) and the Center for International Business at Belmont University, Ambassador H. E. Anne Anderson, Ambassador of Ireland to the U.S., visited Belmont Jan. 28 for a luncheon and discussion of “A Changing Ireland in a Changing Europe.” The audience was comprised of a cross section of the region’s international business leaders and community members interested in international business, global affairs and diplomacy along with Belmont faculty and students. Before the Ambassador spoke, there was a special musical performance by Belmont songwriting students. James Elliott, chair of Belmont’s songwriting program, introduced the students who had participated in a study abroad trip to Ireland during the previous summer, and the group–comprised of Luke Preston, Katie Buxton and Betsy Brewer–performed a song they had written while in Ireland. Ambassador Anderson spoke on further strengthening Ireland-US economic, trade and investment links and also reiterated a need to further deepening the vibrant cultural connections between the two countries. Born in Ireland (Clonmel, Co. Tipperary), Anderson received a Bachelor of Arts degree in History and Politics from University College, Dublin, and a Diploma in Legal Studies from Kings Inns, Dublin. She entered the Department of Foreign Affairs in 1972. Following a range of assignments at home and abroad, she took up her first posting as Ambassador in 1995. Prior to her current assignment in DC, she has served as Ireland’s Permanent Representative to the United Nations in New York (2009–2013); Ambassador to France (2005-2009); Permanent Representative of Ireland to the European Union, Brussels (2001-2005); and Permanent Representative of Ireland to the United Nations, Geneva (1995-2001). Ambassador Anderson has undertaken a wide range of responsibilities in her assignments to date. Highlights of her multilateral work have included chairing the UN Commission on Human Rights (1999) and heading the Irish team in Brussels during Ireland’s EU Presidency in 2004 (she was awarded European Voice “Diplomat of the Year” in recognition of her Presidency role). During her New York assignment, she oversaw a review of the UN Peace-building machinery and was tasked by the president of the General Assembly with facilitating preparations for the 2013 UN Special Event on the Millennium Development Goals. Ambassador Anderson’s particular focus at the UN was on development/human rights/gender equality issues. From her assignment in Brussels, she retains a keen interest in EU Affairs. As a former Ambassador in Paris, her involvement with France also continues – she returns regularly and speaks fluent French. A strong believer in public diplomacy, Ambassador Anderson regularly engages as a lecturer, moderator and panelist in academic, think tank and business settings. She was listed among Ireland’s “25 Most Powerful Women” by the Women’s Executive Network in 2015.